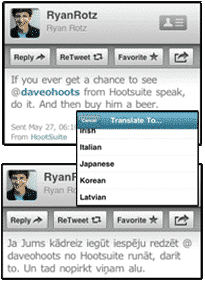 HootSuite keeners likely noticed a handful of new features for HootSuite iPhone released recently including language localization and a batch of handy tools which allow you to forward Twitter messages by email and save links to Instapaper. But this was only part one of the “Elf Owl” release. Today, you can fill your toolbox with even more goodies designed to make social media experience more efficient and enjoyable. Ahhh … feels better already doesn’t it? HootSuite for iPhone update is available at the iTunes App store in Lite (no-cost) and Full ($2.99 USD) versions. Follow @HootSuiteiPhone for updates. We know it’s nice to see an interface in your own language so we added full localization for Japanese, German, Spanish and Portuguese speakers. Users will see all interface elements including options, settings and basic functions translated so no more fumbling to figure it out. 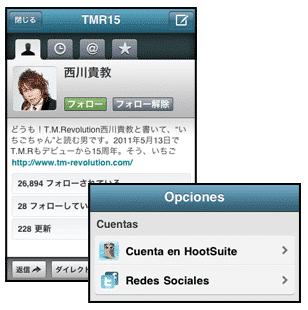 The localization is an industry-first for a Twitter iPhone app — including Twitter’s official app (formerly Tweetie) — and reflects Twitters rapid growth in markets beyond the US. Which languages would you like to see localized next? Add your thoughts at the Feedback channel. The localization is a great addition to the translation tools which interpret to/from 50+ languages. Extra useful for monitoring brand sentiment which is critical for social-savvy marketers who must be aware of public opinion to amplify messages or prevent PR blunders. Plus, now a single click translates foreign messages into your phone’s default language so you can get the gist of what your customers from Thailand to Timbuktu think about you, your brand, or your industry. Fun: Try translating comments from rival team’s fans during the upcoming World Cup matches ;-). Whether you are reading Twitter and Facebook for business or pleasure, you want to interact with your social streams efficiently. Some people call this “getting things done” but we call it “simply handy.” Meet some of the new tools the mobile owls sprinkled in to clear your mind — many of which were submitted by HootSuite enthusiasts through the feedback channel. Don’t let replies confuse you – know the original context of conversations from days before with threaded messages arranged chronologically in chat-like bubbles. Easily participate in the conversation by commenting on anything on your Facebook News Feed — along with posting messages to Facebook Pages and Profiles. HootSuite remembers your position and places you right back in the stream so no more re-reading to find your place when you take a phone call or use another App. Need more info for your update? Interrupted while typing? Save your message as a draft and finish it up later at your leisure without starting from scratch. Don’t want to read an article right away? Just click to save links to the (free) Instapaper service to save for future reading on the big screen when you have the time. Want to share a message with someone not using Twitter? Send any micro-update by email to share the news with bosses or pals to bring them into the conversation. Released a few weeks ago in HootSuite Labs, the “Bump to Follow” tool is gaining fans in noisy clubs and quiet rooms alike who follow by “bumping” phones. Try it ~ but hold on to your phone! 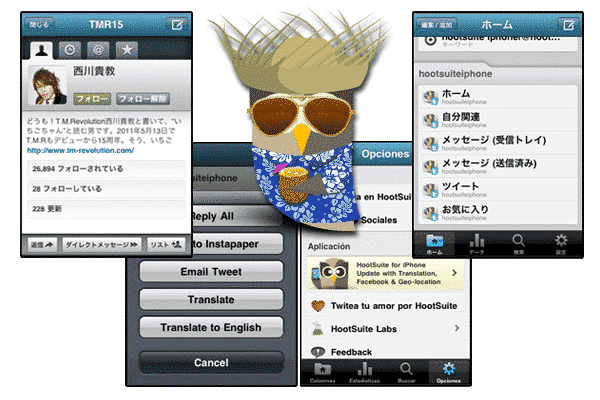 HootSuite isn’t in the league of Ichiro, Godzilla or Spinal Tap in Japan… but we’re getting there. CEO Ryan Holmes recently visited Nippon to show off the localized iPhone at numerous events including speaking at Open Network Labs Live event, meeting users at a Tweetup, attending a Maker Faire, plus talking tech with the CEO of Softbank — Japan’s largest “keitei” mobile phone provider. Curious? Catch the recaps of Ryan’s journey to Japan including pics, vids, and interviews. While not quite as “exotic” as Tokyo, Community Director Dave Olson spoke about community building and shared HootSuite power-tuning tips in Bellingham, Washington plus hosted a mobile-industry trade mission visiting Vancouver from the Netherlands. Stay up with all the HootSuite news and recaps here on the HootSuite blog and by following @hootwatch as well at @hootsuite and @hootsuite_help. Seeking more company information including descriptions, logos and media contact? Visit the online Media Kit.